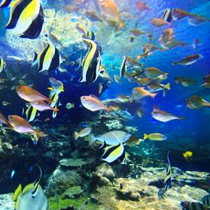 Visit The Okinawa Churaumi Aquarium!The under water world of fish from the Japan current. 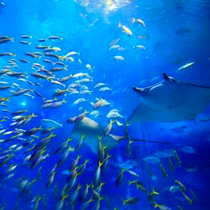 Starting with 8.5 meter whale sharks and Nanyang manta ray which has the world record for its long-term rearing, a wide variety of fish swimming can be seen in the gigantic tank. 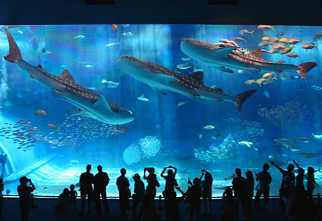 The enormous acrylic window with the impressive view measures 8.2 meter high, 22.5 meter in width and 60cm thickness. 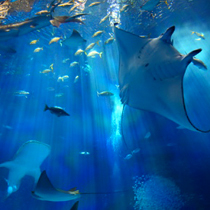 Feel the excitement of as if you can reach the fish. 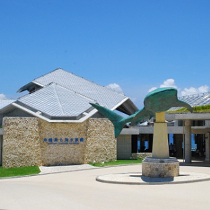 Within Ocean Expo Park in the Motobu district of okinawa. All charge fees are increased according to tax increase from April 1st, 2014. 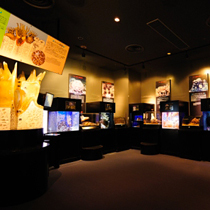 Thank you very much for your understanding and cooperating. 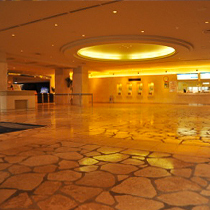 ※A group discount is available for groups of 20 or more. 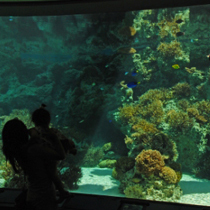 ※Under 6 years old is free. 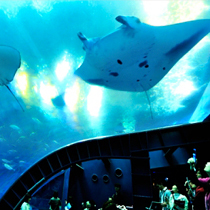 ※Aquarium “After 4 PM ticket” is available from 4PM to last admission time. 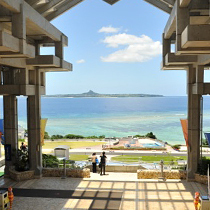 Can be used only at the general counter in the Naha airport.